Hong Kong is a popular travel destination in Asia and it appeals to all types of travelers, from solo travelers to backpackers or school groups. Accommodation can get quite expensive and the quality can vary dramatically. It's best to read online reviews before you make a reservation at any particular hostel or hotel. Rooms are often small and quite bare, but there are a few hostels around with a social atmosphere and all the necessary comforts. 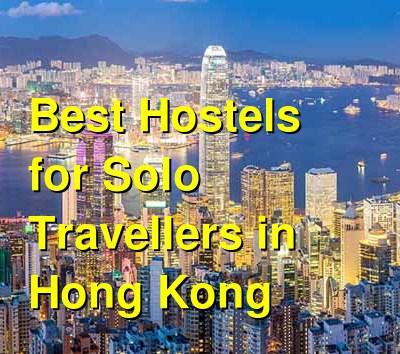 Check In HK is one of the most popular hostels in the city. It's conveniently located in a central part of Hong Kong Island and it's connected to many of the city's top tourist attractions. It's also very close to the metro, so public transportation is easily accessible. The hostel is family run and it has a wonderful atmosphere that is great for solo and independent travelers. The staff is very helpful and can provide all kinds of information on the area and things to do in Hong Kong. The hostel has an intimate feel, so it's easy to make friends and start up a conversation while you're here. There's a small but comfortable lounge area where guests enjoy relaxing. The staff also works hard to encourage social interaction among guests. They host regular dim sum gatherings with excellent food and a fun environment. They also organize a range of activities including hiking trips, shopping, and pub crawls. If you're traveling alone and want to meet other backpackers while you're in Hong Kong, then this is a great place to stay. Urban Pack is another popular hostel for independent travelers and backpackers in Hong Kong. It has a unique contemporary style that gives it a funky but fun atmosphere. The hostel was opened by two Canadians and it recognizes the need for modern comforts while you're on the road. It's located in the middle of the city, just a short distance from the Tsim Sha Tsui station and Kowloon Park. You can walk to many of the city's tourist attractions including Avenues of Stars. It's surrounded by great local restaurants where you can grab a quick bowl of noodles or rice dish. The hostel has standard and superior dorms that sleep either four, six, or eight people. There are both mixed and female only rooms available. The hostel also hosts a range of events on weekends that make it easy for solo travelers to meet other guests. Guests regularly go out together for drinks and there's a favorite bar just steps away from the hostel. Another popular hostel in Hong Kong, this hostel is conveniently located just a couple of minutes from Causeway Bay MTR station. It is centrally located and a great base for exploring the entire city. It's been recently renovated and guests can enjoy a nice common area as well as a roof top garden. These areas are perfect places to relax after a busy day and meet other guests. The hostel has both private rooms and dorms available. Private rooms include doubles, triples, and rooms that sleep five or six guests. Dorms are available that sleep up to nine guests (both female only and mixed). There's also a large 21 bed dorm for those on a particularly tight budget. The beds are large and comfortable and each has it's own privacy curtain and lamp. The hostel also has a shared refrigerator and small kitchen for guests. The hostel appeals to all types of travelers including solo travelers, study abroad students, backpackers, and even groups. Rainbow Lodge Hong Kong is located in the middle of Tsim Sha Tsui just across from the famous Chungking Mansions. It's conveniently located near the Avenue of Stars, Star Ferry Pier, and Harbour City. The staff is wonderful and helpful and can answer any questions you might have. There is a comfortable common area where you can relax and enjoy watching some television and surfing the web after a hectic day exploring the city. This hostel has a wonderful atmosphere for meeting other guests and making new friends. Dorms sleep either six, eight, or ten people. Female only and mixed dorms are both available. Each bed has its own privacy curtain and lamp. The staff organize a variety of group activities and tours that help you immerse yourself in the city. These are also the perfect opportunity to meet other guests if you're traveling alone.